Rexel have released its new binding range of premium quality comb binders featuring the patented Flowline Pro binding system. This patented system makes binding as quick and easy as it could possibly be and ensures perfect results every time. It's a revolution in binding! 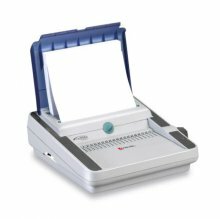 Electric comb binder ideal for use in busy offices. All the new features of the Flowline Pro Range. Binds documents up to 450 pages using up to 50mm combs. Also includes 'simple click' for fingertip control of comb opening. Comes complete with starter kit.